My first week on Nutrisystem was a smashing success. The first week on any new kind of eating plan is always tough getting adjusted to, but this one was not too bad! The first day was a little rocky. The premise behind Nutrisystem is that they send you all of your meals and dessert (oh the desserts! ), but you add in your own vegetables, fruits and snacks. I wasn't quite sure what to add in and when to do it, so that first day, so I don't think that I ate all of the food that I was supposed to and I felt a little hungry. By the second day, I found my groove. I was armed with tons of fresh fruits, roasted nuts, and veggies and I felt like my body was at that perfect point of being satisfied without feeling hungry or overly stuffed. After being overly stuffed nearly every day for a year, this was a HUGE change for me. I used the handy dandy Nutrisystem app (which is my new phone obsession) to help me track what I was eating and when I should be eating it. For example, Nutrisystem has it down to a science, what times of the day it's better for you to have a snack full of protein and what time it's better to eat fruits to keep your body feeling full and satisfied and giving it exactly what it needs when you need it. I have to say that my favorite part of the Nutrisystem plan so far is the protein shakes. I've been having one of these mid morning every day. Before this, I'd never in my life had a protein shake, but I've got to say- the creamy chocolate protein shakes are rocking my world! It's like drinking melted ice cream. And the best part? It's in addition to your meals- not a replacement for your meals. I'm not a drink your meals kind of girl, so this plan is perfect for me. I get the protein supplement and my regular meals. Score! In addition to the awesome food and protein shakes, I also tried to get moving this week. For starters it was only two days this week ( a long walk with my mom and a bike ride with the kids). But that's two more days than I did the week before and I'm going to try to keep building on it. Small steps! Now it's time for the big reveal... this week's total weight loss is... -5.2 pounds. Whoop Whoop! I know that I can't expect it to be that drastic every week, but I'm looking forward to seeing that number continue to trend downward as I get my health back in order! 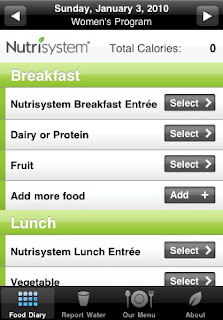 If you'd like to do this Nutrisystem journey along side of me, check out how to get started on their website!